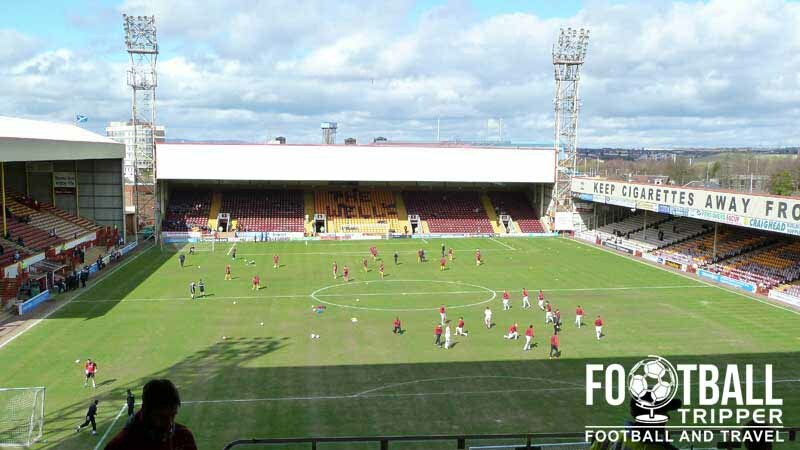 Fir Park is a football stadium located in the city of Motherwell in North Lanarkshire. Home to Motherwell F.C since opening back in 1895, the stadium has undergone numerous renovations throughout its history, most recently in 1995 when the Davie Cooper Stand was added. This increased the current capacity to today’s figure of 13,677. 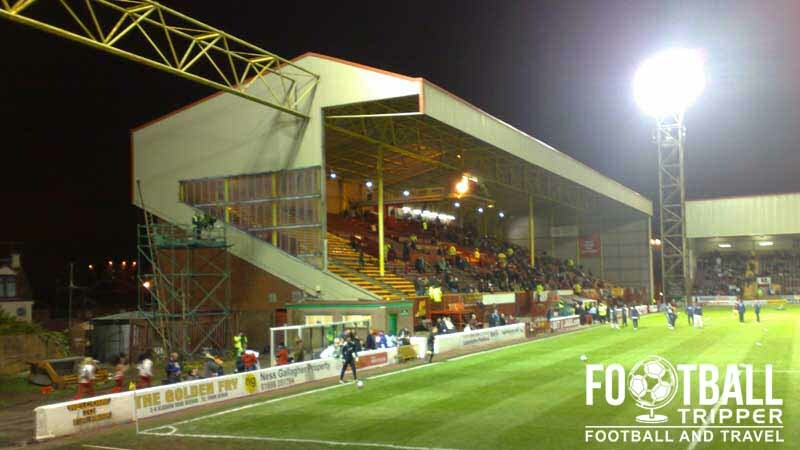 Motherwell formed 9 years before setting up home at Fir Park in 1895 but such is the influence and legacy of the club moving to the site, you could argue that the birth of Motherwell really happened when the club made Fir park their permanent home. Not when they played matches at either Roman Road and Dalziel Park in the years preceding this. Perhaps, slightly too dramatic, but the land on which Fir Park was built belonged to Lord Hamilton of Dalzell whose racing colours of Claret and Amber were adopted by the club upon relocation. 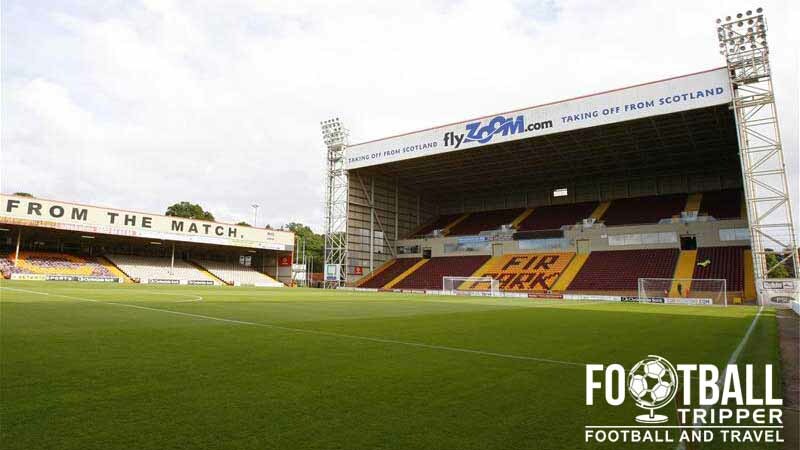 With a tenancy lasting over a 120 years and counting, Fir Park has been the one constant throughout the club’s history such as the Scottish League Championship victory in 1931-1932, the Scottish Cup victory in 1991 and numerous outings in Europe including the 2012-2013 third qualification round match against Panathinaikos, and first round game against Borussia Dortmund in the 1994-1995 UEFA Cup. Like the majority of British Clubs, the stadium has decreased in size since the turn of the 20th Century with both the Safety of Sports Grounds Act in 1975 and the Taylor Report in 1990 encouraging the restriction of terraces in favour of seating. As a result, Fir Park’s record attendance was set back during the 1951-1952 Scottish Cup when The Steelman took on Scottish giants Rangers in front of 35,632 supporters in a replay of the first match. In the stadiums current configuration, work was completed in 1995 during the centenary season of residency after the new single tier North Stand named in honour of former player Davie Cooper was opened in time for the new season. 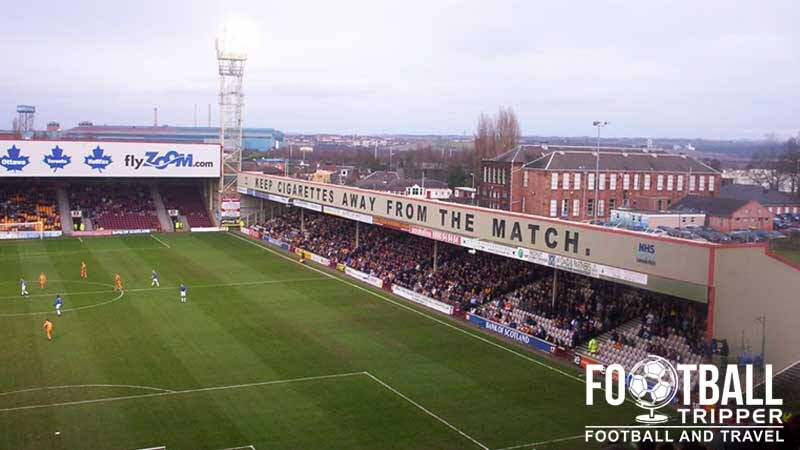 Two years prior to this a new £2.2 million south stand opened which consisted of two tiers with the main stand which was initially built in 1962 being renamed to the Phil O’Donnell stand in January 2008, in tribute to the former Motherwell Captain who tragically died on the Fir Park pitch. Fir Park Stadium is comprised of four stands: North, East, South and West. Away fans are housed within the Maxim Office Park Stand which is the largest of the four stands, capable of seating over 4,500 supporters. Located behind the southernmost goal, only the lower-tier is usually inhabited by visiting fans on matchdays, and the stand is famous for being smaller than the width of the pitch due to a land dispute with a nearby resident. The small town of Motherwell doesn’t have as many drinking options as some Scottish cities, however there are still a few decent boozers worth checking out. Starting next to the station there is The Brandon Works Wetherspoons, and the Railway Tavern. As you follow Windmill Street down towards the ground a few pubs pop up including the small Brandon Bar, New Century and the Windmill Tavern. At the stadium the Cooper Bar is a family-friendly place to drink before kick-off with the club creating a free game area, and face painting on certain matches. Outside of the station there is a McDonald’s on Brandon Parade as well as a Subway, with two Indian (Spice of Life and Kamran Tandoori) and two Chinese restaurants (The China House and Hup Lee Buffet) five minutes away on Merry Street. On your way to the stadium there are also numerous independently run eateries along Brandon Street including chip-shops and kebab houses. Motherwell run a club shop at Fir Park which is open each day of the week excluding Sundays in addition to their online website, Motherwell Direct. 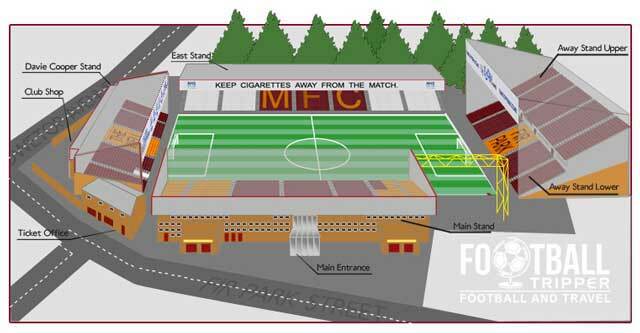 It doesn’t appear as if Motherwell currently offer fans the chance to undertake a guided tour of the facilities at Fir Park, however if this ever changes we’ll be sure to update this section. Please note that concessions refers to adults over 60, and full time students, with a family ticket admitting one adult and one juvenile. Prices can vary for cup matches, and premium pricing comes into affect when Motherwell host Celtic which for most tickets is a £4.00 increase. Fir Park Stadium is located next to Knowetop Primary School approximately 1 mile south of the centre of town. Located close to the M74 the stadium is highly accessible from the rest of Scotland. The good news is that there are parking spaces available at the ground, the bad news is that there are only 40 in total with 20 located within the Fir Park School Car park, and 20 within the Knowetop carpark both of which sit adjacent to the ground. Street parking is available within the streets around the stadium, however you can also use the nearby car parks within the Civic Centre, Motherwell Concert Hall, and behind the health centre on Parkhead Street. Fir Park is located approximately 1.2 miles from south-east of Motherwell Station with the resulting journey likely to take the average fan no more than 20 minutes. The main station of the city has direct connections to other major cities in the UK including London, Glasgow and Edinburgh. Airbles is technically the closest train station to the ground. There are numerous bus services which can drop you off within five to 10 minutes of the stadium including: 240, 241, 242, 266 and 267. If you are unsure please ask the bus driver who should be happy to held or consult the First Group website for the latest routes and timetables. Fans who are making the journey from Glasgow will be pleased to know that there is the X11 Bus service which takes you directly to Motherwell. Departing twice an hour from Buchanan Station in the city centre, it is a popular way to make the trip. Within Motherwell there are only two potential places to stay with The Bentley Hotel offering en suite rooms within a Victorian townhouse, and Moorings Hotel the ever so slightly more expensive of the two positioning itself as being more modern complete with on-site grill.